We investigate mechanisms of spatial perception and memory, coupled with adaptive motor behaviors, which enable successful navigation in complex 3-D environments. 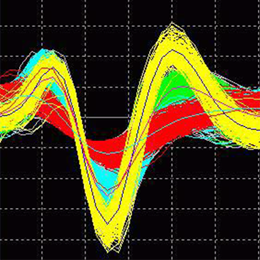 Our empirical studies exploit an animal model that provides explicit information about the signals used to guide behavior through its active sensing system. 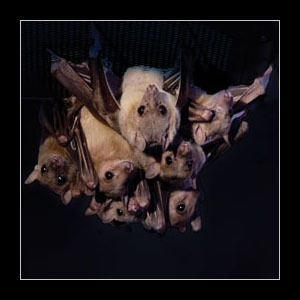 This animal model, the echolocating bat, coordinates its sonar signals with flight maneuvers in response to dynamic echo information, and exhibits a rich display of natural sensory-guided behaviors. Using the bat model system, our research program integrates behavioral, neurobiological, and computational studies of scene analysis, space representation, decision-making, sensorimotor integration and flight control. 04/11/2018 Lab featured on Discovery Channel. 04/06/2018 Angie Salles awarded HFSP and Pew Postdoctoral Fellowships! 04/01/2018 Bruce Nguyen receives undergraduate STAR award for 2018 summer research! 04/01/2018 Samantha Dominguez receives undergraduate STAR award for 2018 summer research! 11/14/2017 Batlab research was highlighted in the Netherlands. 10/31/2017 The lab was featured on National Science Foundation. 10/30/2017 Angie was featured in the article of INTERNATIONAL BRAIN RESEARCH ORGANIZATION. 10/19/2017 Congratulations to Ninad, who just passed his dissertation defense! 09/20/2017 The lab was featured in Science News. 06/06/2017 The lab was featured on the JHU HUB. 05/01/2017 Congratulations to Cindy on the 2017 Willian and Christine Hartmann Prize in Auditory Neuroscience! 05/01/2017 Lab was awarded Accelerator/Innovator Grant - David M. Rubenstein Fund for Hearing Research! 02/03/2017 Congratulations to summer intern, Traia Roper, on her admission to vet school! 10/16/2016 Mel Wohlgemuth's research was featured in The Baltimore Sun. 09/17/2016 The lab was featured on the JHU HUB. 10/26/2015 Congratulations to Dan Ju on being awarded David S. Olton Research Award. 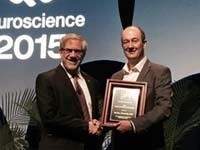 10/09/2015 Lab alumnus Nachum Ulanovsky receives 2015 Society for Neuroscience Young Investigator Award. 04/30/2015 The lab was featured on the HUB. 04/13/2015 Ben Falk passed his dissertation defense. Congratulations, Ben! 04/01/2015 The lab was featured in Johns Hopkins Gazette. 03/30/2015 Ninad Kothari passed his qualifying exam. Congratulations, Ninad! 01/22/2015 The lab was featured in Johns Hopkins Magazine.